A team of researchers at the Clever Dog Lab (oh, how I’d love to work there …) at the Messerli Research Institute in Vienna suggest teaching older dogs to play brain games on touchscreen computers and tablets. Yup, Lumosity for dogs. The researchers have some games that they developed and tested out and that they are now trying to prepare for retail sale. That’s all well and good, but the real premise of their study is that older dogs need — and benefit greatly from — mental stimulation and training. And that most dog owners (and trainers) don’t really do much training with older dogs. While dog sports like agility might be beyond the capabilities of, say, an arthritic golden retriever (as Jana was during her last years), some dog classes can work for older dogs. Jana loved every second of her nose work classes (well, except the seconds that other dogs got to look for treats and she was not in the ring). The instructor, at the beginning of the first class, told us handlers that the dogs could bark as much as they wanted and we were not to use the ‘N’ word. (No.) Jana had found her doggy paradise. Throughout her life and well into old age, Jana’s mind was sharp and, if a cookie-earning opportunity arose, she’d stick with the challenge until she’d earned and eaten every last crumb. We did exercises on canine fitness equipment, practiced imitation games, and worked with picture cards that Jana could choose: ball, tug toy, popsicle. (For some reason, she always went for popsicle…) I never thought of teaching her to use a computer, but I am sure she’d have mastered that as well. Cali is less intellectually oriented than Jana, but she does love nose work. I suspect that age is less of a factor than temperament. Cali’s not interested enough in learning (or earning treats) to really work at much. She’ll stick with a nose work search longer than she’ll work at a Kong or other food toy. 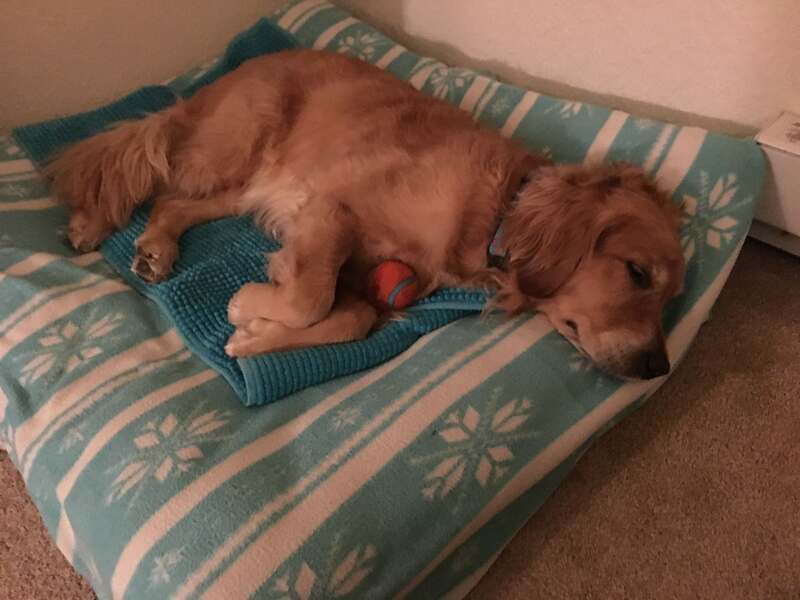 And she’ll play with a tennis ball all day (and take it to bed at night). I doubt she’d enjoy computer games, though she does love TV, so I could be wrong about that. My main takeaway from the dogs and computers study has nothing to do with whether dogs want to, need to, or should learn to use computers, though. It is all about us: Don’t give up on your older dog. Figure out what she loves about her favorite activities and adapt them for her changing physical needs. Keep challenging her and offering stimulation. It will keep her mentally fit — and keep your bond strong. Great idea though I think Dudley my choc lab would struggle with the ‘staying still long enough’ bit. Even in his dotage…. I really enjoyed this post and I think it is something to remember as your beloved dog ages. It is too easy to get into the “S/he is already trained” or “S/he will never get this” mode. Train and play with your older companion as much as S/he can endure. Just because your dog, or you for that matter, can’t do the activities that were once the norm is no excuse for discontinuing your activities altogether. Find ones that work for your situation and dive in. Thanks for the nice presentation. I think Storm may need some new activities to keep him happy. He does play with Ace now, but that doesn’t do much for my relationship with him. He really liked nose work. I wonder if there are opportunities to delve into that further in the Missoula area. Do you know of any?